Before we get started, let’s take a moment to acknowledge the momentous fact that this is going to be my first post in this blog. I’m going to talk about my summer vacation with my older brother. He has been in the U.S. for quite some time to visit me. The trip itself was extremely late, just three weeks before the start of my fall semester. Although technically I have been on holiday since mid-May, I didn’t have the chance to go on a long vacation due to my summer research commitment. So, a day after my last day of research, on August 9th, my brother and I flew to Seattle, the first stop of our 12-day trip to four cities in four different states of the United States. We stayed there for three days and two nights, before leaving for Portland on the 11th. 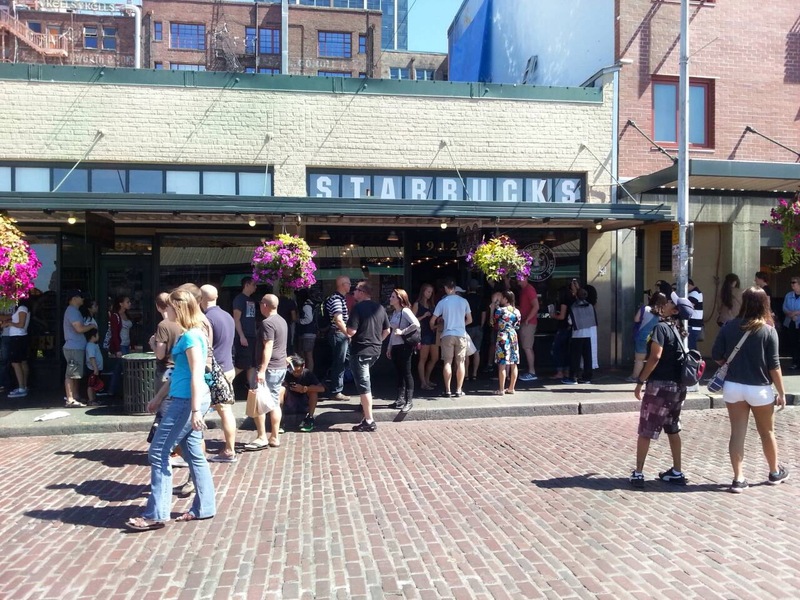 The first Starbucks store located at Pike Place Market–the line was so long! for its great touristy atmosphere, lots of street entertainment, wide selections of goods and food. I just love public places with a bunch of people and it’s great to see so many things going on all in one place! Also, if you’re a Starbucks junkie, you may want to check out the first Starbucks store located in this market! 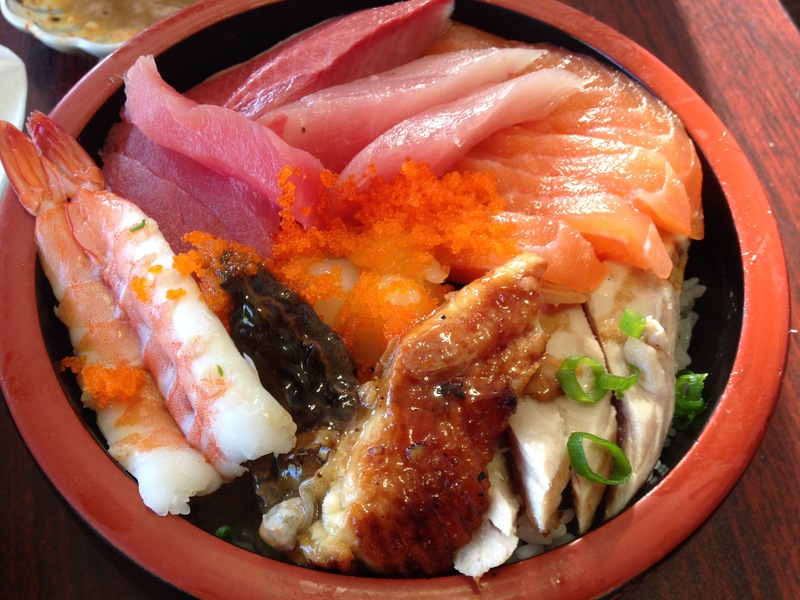 The famous chirashi bowl: a generous bed of rice covered with assorted fresh seafood. I’ve heard so many of my Indonesian friends who study in Seattle raving about it and finally I manage to try it myself, haha! To be fair, though, it kind of deserves the hype! Huge portion, good taste, cheap price: all college students care about. Plus it’s Asian food, and almost all of the Asian food in Providence is not that good, so I’m happy with what I had! for reasons you would find just right down below. Space Needle. Left: how it looks at night. 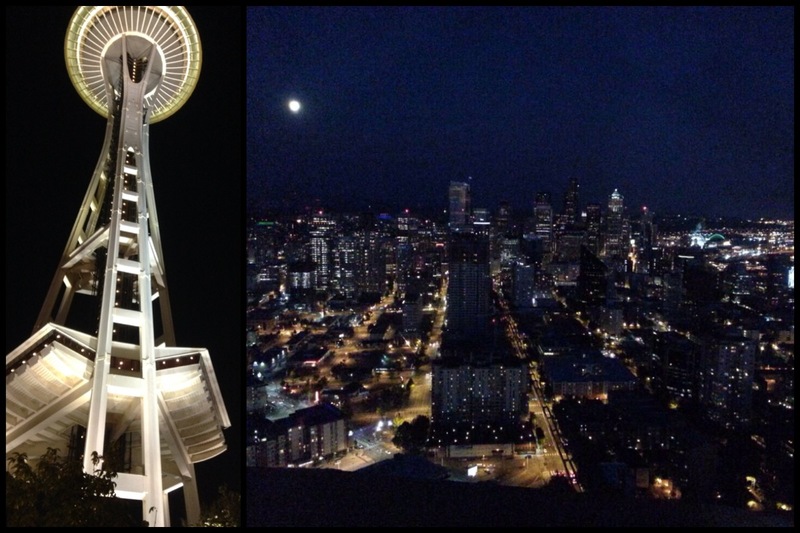 Right: nighttime Seattle view from the top. [spoiler: Chihuly wins!] Since both are located in the same complex, if time and/or admission fee is an issue for you, having been to both, I personally think you should opt for Chihuly Garden and Glass Exhibition. The view from the top of Space Needle is good, but far from spectacular. If you’ve been to other world’s tallest buildings (Empire State Building, Rockefeller Center), then you pretty much got the idea on what to expect. 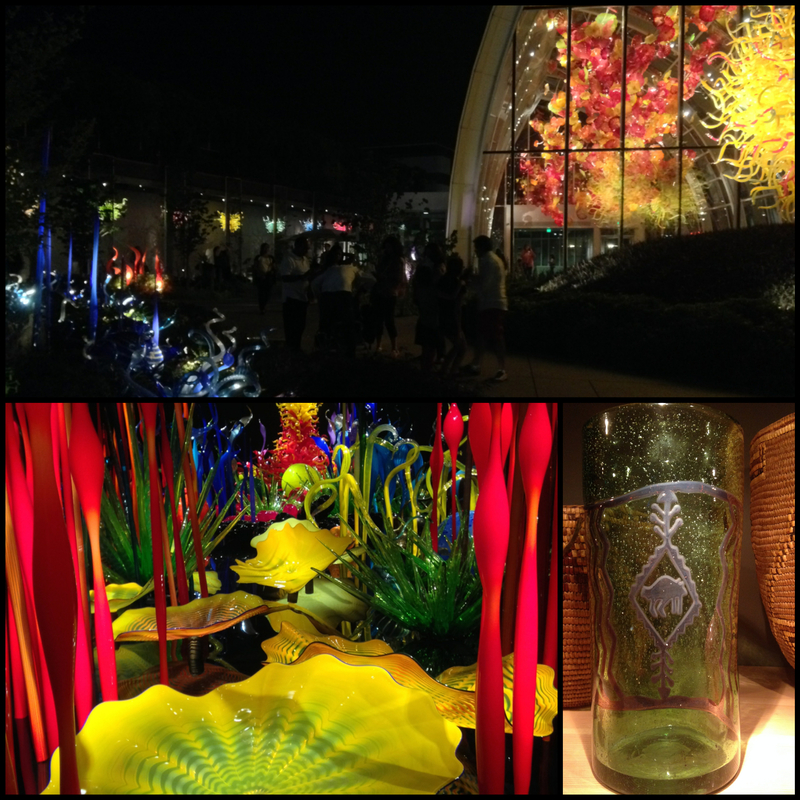 Chihuly Garden and Glass. Top: view from the garden, you can see the artwork inside the glasshouse. Bottom: some of the thematic glasses at the exhibition. Chihuly, on the other hand, is something that I haven’t experienced before. The exhibition consists of several rooms and one glasshouse exhibition, as well as a garden–each area with one theme with a couple of glassworks that are all breathtaking. There’s the chandelier walk, in indoor alley, with–as the name says–several different glass chandeliers with different colors and designs. There’s also a room with Native American art kind of theme, and another one having an ocean theme. I went there at night, so I can’t say anything about how the artworks look during daytime, but I can guarantee that the lights just make everything much more beautiful! Another good thing is that you can get your picture taken by a staff photographer and obtain a digital copy sent to your email for free! This may not be true for everyone, but personally, I am not a big fan of Seattle public transportation system. That said, you can still definitely rely on it to get around. Seattle doesn’t have any subway, which is a downside for me. Although public buses are really nice, the wait between each bus is kind of long (~30 minutes). I rode the bus twice on a Sunday, and for the first bus, it arrived 15 minutes later than the scheduled time. If you travel in a party of four, then taking a Lyft would be a good idea. (Tip-ception: use the free rides if you’re new to Lyft; it often has offers for new users.) I took a 10 to 15-minute Lyft ride from the Space Needle back to my Airbnb place in Fremont and it costed me $9. In comparison, it would cost you $2.50 for one bus ride or $1.25 if you’re 18 years old or younger. If you’re in a group of three or four, then Lyft would offer a better deal. (Note: They don’t provide change, but they do accept both coins–including pennies–and bills.) Even if your Lyft ride ends up being more expensive than public transport, I personally think that it’s worth it, considering that it’s more convenient and more importantly, takes far less time. The view from a trail at Bainbridge Island. 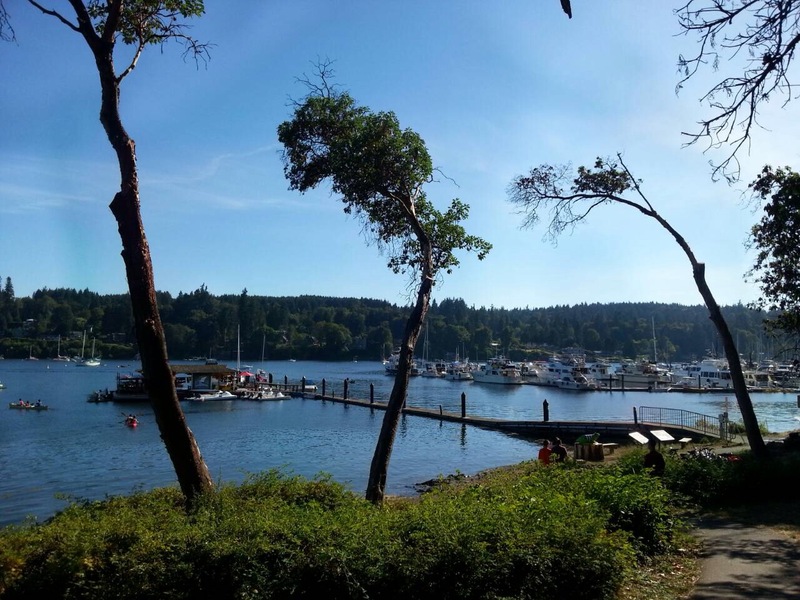 My Airbnb host, Dennis, recommended my brother and me to try going to Bainbridge Island. After grabbing some snack/light lunch from Piroshky Piroshky, we decided to take the ferry from Waterfront Seattle to Bainbridge Island. It costs us $8 each for a roundtrip ferry ride–each ride takes approximately 30 minutes. The island is pretty nice, it’s pretty quiet there. We went there on a Sunday, and it turned out that the bus doesn’t run on Sundays. That made us cancel our plan to go to Bloedel Reserve since it was too far to walk there. We finally took a walk along the trail close to the port and just walked around downtown. We tried to go inside the Bainbridge Historical Museum, but unfortunately it was already closed by the time we arrived (it closes daily at 4 PM, I believe), which was another bummer! That said, I’d recommend Bainbridge Island if you’re looking for some natural scenery close to Seattle. Definitely check out Bloedel Reserve if you plan to go to the island; it seems like a really nice place! Another ferry from Seattle also goes to Bremerton, which you may want to consider. It takes longer to go there–about an hour–and from a super quick internet search, it seems that it has more options on things to do besides outdoors.